The rhythmic echoes of picks reach your ears from deep within the nearby mines. Grabbing a lantern, you venture through the winding tunnels toward the sound. Long shadows are cast across the chamber from your light, illuminating miners who are hard at work. Their steady efforts are rewarded! A large nugget of a blue stone is wrested from the host rock. Just as they have for over 7000 years, miners employ traditional artisanal techniques alongside modern innovations in pursuit of the world’s oldest continuous source of turquoise stone. Material from any area where the ancient Persian empire once stood can be considered Persian turquoise. In modern times, some dealers also use it as a descriptor for the best quality blue turquoise gemstone. “Persian blue” is typically the most expensive turquoise gem you’ll find. In the Ancient World, Nishabur was an essential stop along the fabled Silk Road. From here, turquoise gems would make their way to both Europe and Asia. The nature of this trade route allowed communities to specialize in their wares deeply. The people of this region specialized in Persian turquoise, due to the proximity of the mine. They lead the world in quality turquoise for centuries, without peer. In modern times, only turquoise from the American Southwest compares in quality. Learn how to identify Neyshabur turquoise, and what sets it apart from material found in the United States and China. With its rich history and timeless appeal, Shop LC is your guide to Neyshabur turquoise. Is Persian turquoise valuable? The value of colored stones is typically determined by a combination of its color, clarity, cut, and carat weight. This is no different when determining what Neyshabur turquoise is worth. These guidelines will help you choose turquoise stones for your collection. As with any colored stone, color is the guiding factor when adding to your collection. Shop LC Neyshabur turquoise is known for its brilliant blues. Flecked with inclusions of pyrite, a striking mottling pattern should be evident throughout the entire stone. Dealers consider even distribution of color and pyrite to be the most desirable, but individual tastes may vary. Look for interesting arrangements of turquoise and pyrite when choosing a specimen for your collection. Thanks to Mother Nature, every stone will be unique and special! An opaque stone, Neyshabur turquoise takes a polish very well. Finished stones possess a waxy luster, and the pyrite will sparkle with its shine. Over time, the pyrite material may develop a gentle patina from normal wear. The blue of the turquoise should remain vibrant and bright. The surface of your stone should have an even surface after polishing. 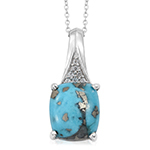 Minor blemishes may be present where turquoise stone intersects with pyrite material. For centuries artisans have been shaping rough turquoise into cabochons. The most popular technique for shaping opaque gemstones, lapidaries form cabochons into soft domes with a flat bottom. Cabochons are primarily shaped into circles and ovals, though other shapes are possible, such as pears and cushions! When choosing a turquoise cabochon, look for symmetry across the shape of the stone. It should possess an even form. The flat bottom lets it sit correctly when placed in turquoise jewelry. Cabochon stones are often bezel-set, with metal wrapping the sides of the gem to keep it secure in jewelry. For additional security, a small amount of glue may also be used to hold the stone set in place. This variety of Neyshabur turquoise is available in a variety of sizes, providing fun options for everyone! Round stones are ideal for those wishing for a more subdued stone, occurring in sizes between 8mm to 9mm. If you need a bigger stone, an oval or pear is a better option. Both shapes lend themselves well to providing the appearance of a larger gem while keeping cost down. Find ovals in sizes up to 20mm by 15mm and pear-shaped stones up to 16mm by 12mm in size. Between these two extremes, you’ll find all other shapes available in sizes to suit every taste and budget. Neyshabur turquoise occurs in bigger carat weights, but the demand for the stone translates to a higher price per carat. Treatments are techniques used to increase the durability and beauty of a stone that otherwise may not be suitable for use. Most rough turquoise has a chalky and porous quality when it comes out of the ground. Typically, less than five-percent of turquoise is ready for shaping without treatment. Neyshabur turquoise undergoes impregnation to increase the durability of the stone. Colorless polymers stabilize the material, making it easier for an artisan to shape the stone. Impregnation is a reliable treatment method, with good stability. You’ll find caring for Neyshabur turquoise to be extremely easy. 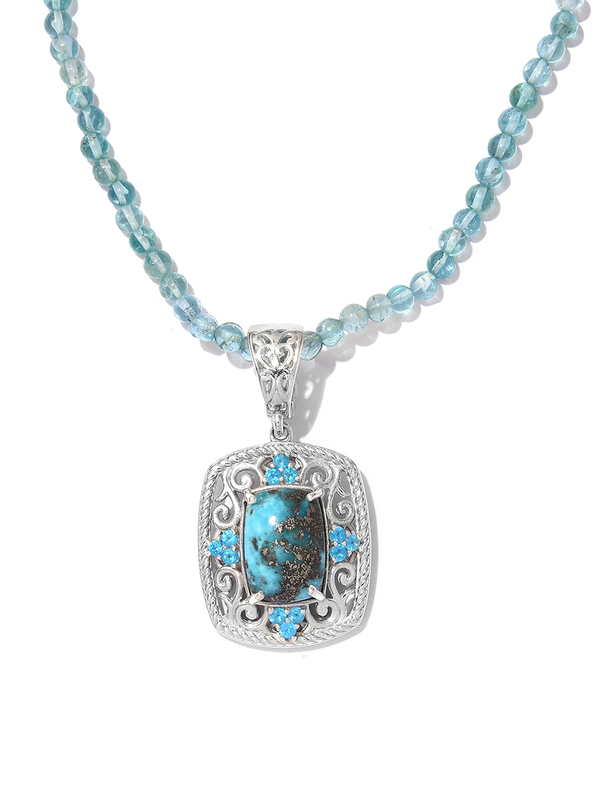 Thanks to the treatment of the material, Neyshabur turquoise only requires basic gemstone care. As with most gems, always exercise caution when using ultrasonic and steam cleaners, or harsh chemicals. These always carry a risk of damaging stones. Shop LC recommends avoiding ultrasonic and steam cleaning Persian turquoise. Who Can Wear Neyshabur Turquoise? Turquoise continues to be among the most coveted gemstones. For centuries, turquoise was a stone many aspired to own. In the Arabic world, turquoise is a stone of prestige. Ancient Persians classified these stones into three grades. The ideal stone during these times was an even blue color, free of matrix. The modern equivalent would be Sleeping Beauty turquoise. How Does Neyshabur Turquoise Compare to Other Turquoise Stones? Often, it’s difficult to establish a stone’s provenance by appearance alone. Many visual cues can be altered by treatment, and even thorough testing doesn’t necessarily confirm the origin of a gemstone. While turquoise faces many of these same issues, the appearance of a stone often provides clues to its origin. The color, saturation, and tone of a turquoise gem give insight on where it came from, in addition to factors such as the host rock in its matrix. The pyrite inclusions in Neyshabur turquoise are one such quality that sets it apart from other turquoise stones found at Shop LC. Mojave turquoise bears similar qualities to Neyshabur turquoise. Both stones contain inclusions that provide a metallic sparkle. Setting them apart, the pyrite of Neyshabur turquoise occurs as flecks, where the metal of Mojave turquoise shows as webbing throughout the material. Mojave turquoise occurs in a variety of colors, including blue. Comparing the blue of each gem, you see that both share a similar mottled pattern. The blues of Mojave material are darker than those of Neyshabur stone. Kingman turquoise and Sleeping Beauty turquoise are both easily distinguishable from Neyshabur material. Kingman and Sleeping Beauty both display very clean color, mostly free from any additional matrix. Both of these American gemstones show even color when compared to Neyshabur turquoise, primarily free from mottling. All three stones are very blue, with the color of Sleeping Beauty and Neyshabur rivaling one another. Where Does Persian Turquoise Come From? Ancient Persia, now modern Iran, is one of the sources of precious turquoise. 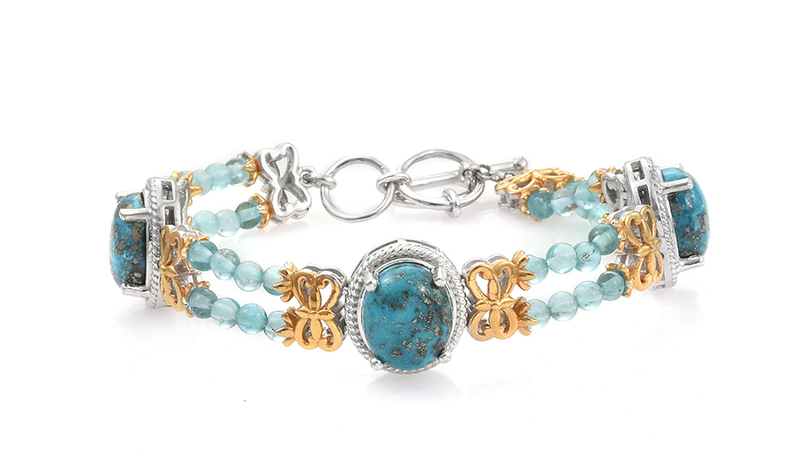 It is the most significant source of Persian turquoise. Shop LC sources our supply of Neyshabur turquoise from mines located in the Binauld Mountains, near Nishabur, Iran. The mines themselves are based around the village of Firoozeh, about 30 miles northwest of Neyshabur. Notably, Firoozeh is named for turquoise in the Farsi language, owing to its significance to the way of life for people here. How is Neyshabur Turquoise Mined? For 7000 years, turquoise mining operations of some sort have existed in Nishabur. Modern miners continue to use the artisanal techniques of their forebears, in addition to newer tools such as dynamite. Though dynamite makes the mining process more efficient, blasting turquoise-bearing rock can also damage the total yield. For this reason, government bodies are exploring ways to modernize mining methods. Besides, current export regulations reduce the amount of rough that can leave the country. There is a great deal of concern about lost profits from damaging the viable rough material and modernizing the mining and export process to compete on a global scale. Currents estimates suggest that between 40 to 50 tonnes of rough turquoise leave the country each year. Experts believe that at these levels of production, the mine has enough material to continue producing for 200 more years. 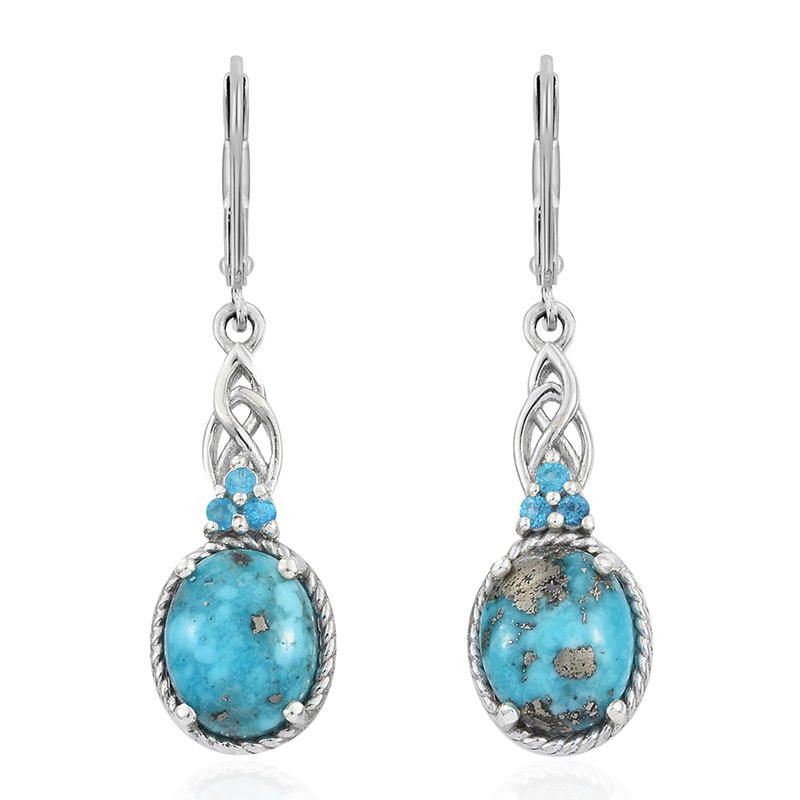 Rough turquoise is then pre-shaped by local artisans. Pre-shaping is the process of roughly forming a stone into a mockup of its final polished shape. Over 300 workshops deal in working with Persian turquoise in the Khorasan Province. Despite this, fewer than 25 turquoise masters remain. These are experts who exclusively deal in turquoise. Shop LC finishes the process with its expert lapidary team. Stones undergo additional shaping and polishing before finally being set in gorgeous Neyshabur turquoise jewelry. What Does Neyshabur Turquoise Mean? As one of the earliest gemstones known to humanity, people have built an impressive body of lore around this amazing stone. Persian turquoise continues to be held in high-esteem by Arabic cultures. Since antiquity, their culture has employed many methods of describing color grade and stone quality. By the 18th to 19th century, three primary categories emerged to be widely recognized. Angushtari was considered to be the top-grade and was prized for use in turquoise rings. Stones were reviewed on an individual basis, with many tiny qualities setting one apart from another. The slightest deviation in quality drastically lowers its value. Barkhaneh was the middle-grade material; itself divided into four separate sub-categories. Artisans would use this material for inlay and other jewelry, or it was traded to Europeans for jewelry use. Arabi is the final grade of Ancient Persian turquoise. Also subdivided by variations of color or blemish, these stones were used in large items such as amulets and bracelets. Persian turquoise is also considered to be a “horse stone” by many nomadic cultures. Wearing a turquoise was thought to prevent one from falling or being thrown by a horse. They were also believed to keep horses healthy and calm. Even today, horse tack is frequently decorated with turquoise stones to continue this tradition. In Ancient Persian culture, turquoise stone was heavily associated with the eye. Besides dispelling the ‘evil eye,’ these rocks were also thought to cure ailments of the eye. Merely carrying a turquoise was said to sharpen eyesight. Besides that, placing a turquoise against the eye would reduce inflammation, and even heal an injury. The purity of color was held in high-esteem by Ancient Persians. There are several superstitions associated with stones turning color. In the first, a woman’s faithfulness could be measured by her jewelry. Turquoise would remain bright and blue when she was loyal. If she were to stray, the jewelry would fade. On the other hand, the stone was thought to indicate general health. 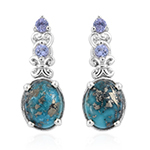 When full of energy and vigor, your turquoise gem would remain vibrant. However, if your health were to decline, your turquoise stone would crack and fade. Finally, Persian turquoise was supposedly a signifier of air purity. The rock would be bright when the air was pure and grow dim when the wind was polluted. If exposed to the light of a New Moon, a turquoise gem would become infused with luck, bringing many good things to its owner. Modern gem therapists continue to value turquoise. They credit the stone with treating infections of the throat and lungs. Crystal healers tout its ability to cure diseases and reduce inflammation, especially inflammation of the eyes. On the spiritual side, turquoise combats feelings of depression and promotes self-confidence. 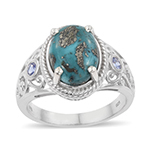 Is Persian Turquoise a Birthstone? Turquoise has stood the test of time, retaining its popularity over the centuries. Since at least the 15th century, and perhaps even earlier, turquoise has been a birthstone of some sort. In modern tradition, Neyshabur turquoise is a birthstone for December. It stands alongside tanzanite and zircon as a symbol of this winter month. Turquoise is also a traditional gift for the 11th wedding anniversary. 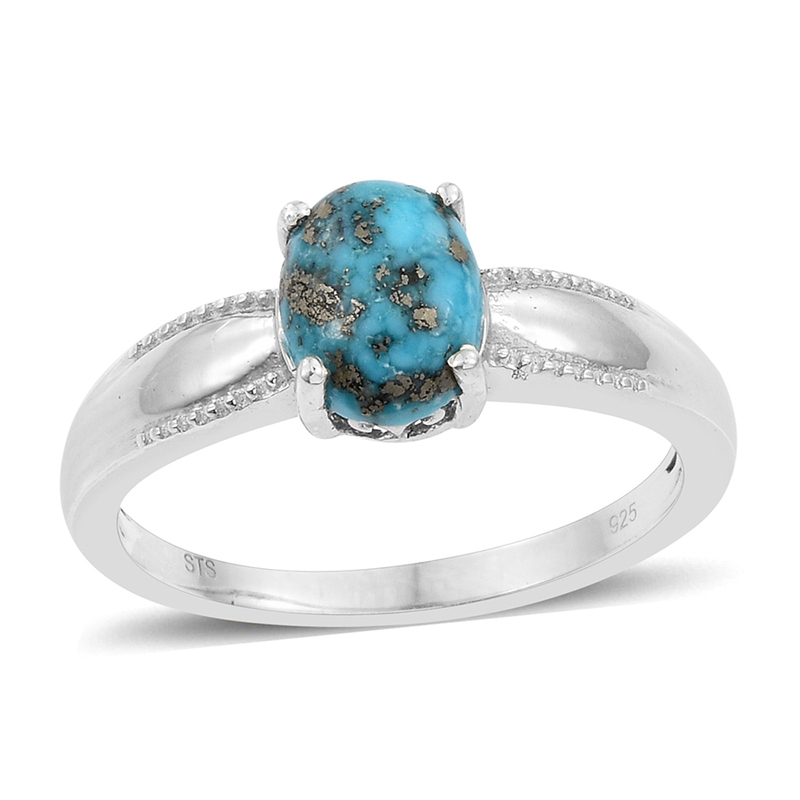 Persian turquoise ranks 5 to 6 on the Mohs scale of hardness. Neyshabur turquoise is known for a bright and vibrant heavenly blue. Expect mottling of color, with pronounced inclusions of pyrite. Shop LC sources Persian turquoise from Binauld Mountains, Khorasan Province, Iran. Neyshabur turquoise undergoes impregnation treatment to increase durability.